Look, only you know the kind of wheeling you want to do. And sometimes you need axles that go above and beyond the bolt-in options available. That’s where EmWest Motorsports Crawl King Axles come in. Our number one goal is to provide a completely customizable product using the best brands for every vehicle. 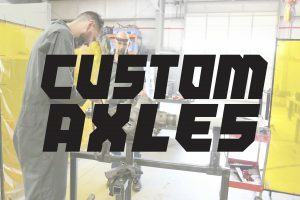 Striving to push the envelope with each build, we focus on customer specifications to ensure each axle ships out the door exactly as requested, no matter if you have Jeep TJ or JK, Land Cruiser or custom buggy. Start to finish, the customer is in the driver’s seat. 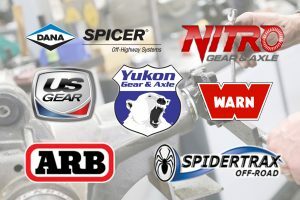 We have nearly 50 years experience and a history of excellence in providing genuine Dana Spicer drivetrain systems to commercial off-highway vehicle manufacturers around the world — everything from logging equipment to forklifts. Mud on your fenders, hands on the wheel, it’s just you and your rig out there. Sometimes things break, and we know people who say, “If something doesn’t break, you aren’t wheeling hard enough.” So when you put your rig through the ringer, and wheel it a bit too hard — call us for a Crawl King axle solution. EmWest Motorsports delivers unparalleled knowledge, comprehensive service, and the right drivetrain solution for you.